Every bar has its own aura and atmosphere that draws customers in, and keeps them coming back. In New Mexico, each of its bars has its own unique vibe. And it’s not always about the drinks. Although a full-stocked bar is necessary, it’s about the environment the bar provides, too. Here are some excellent drinking establishments that have put all these elements together to create comfortable places where customers become regulars. Housed in the oldest building in Taos, this local watering hole on the Plaza is a landmark. Although not as old as its 400-year-old home, it’s been serving customers for more than 20 years. You’ll find this hangout tucked away in the alleyways of town, the arched entrance ringed with bright turquoise letter. There’s a full bar and the drinks tend toward the side of a generous pour. Margaritas are exceptional, particularly paired with the authentic Mexican fare. Voted “Best Happy Hour” by the Best of Taos County People’s Choice Awards. A great place to sit at the bar, under the enormous skylight late into the evening. Open nightly. A casual, funky local’s favorite that welcomes all visitors with all you can eat popcorn, happy hour specials and the best martinis and margaritas, particularly the jalapeno one, in town. It’s been named best of Santa Fe and one of the top 19 bars in the world. Located across the street from its restaurant counterpart, the Pink Adobe, in the center of the historic Barrio de Analco the setting is interior is distinctively southwestern with a tree growing right through the roof. Open six nights a week until it closes. Here the bartenders are also called mixologists because of the signature handcrafted cocktails they create in this upscale nightclub and bar. Highlights are twists on classic margaritas, specialty mojitos and an eclectic variety of mixed drinks with everything from maraschino cherry liqueur to grapefruit bitters to vanilla-bean lemongrass syrup. There’s also a fully-stocked bar of fine spirits, plus wine and beer. Weekday happy hour boasts four for $4 — $4 craft beer, $4 house wine, $4 well drinks and half-price price appetizers. Sit outside on the patio lounge or hit the dance floor as local DJs spin the latest music. Open six nights a week. This is a honky-tonk, a place where country music is played seven nights a week and the dance floor is filled with country two-steppers. For close to 40 years, this town landmark has been serving up drinks that are honest and cold to fun-loving customers who like to sip a drink, sit-a-spell and enjoy the live music that happens year-round. Voted Ruidoso’s best bar. Open all night. Cowboy boots and hats suggested. Since 1939, the legendary Bull has been a mainstay on Main Street, providing locals and visitors an authentic saloon experience. The casual, fun atmosphere of this local watering hole makes hanging out with friends and family and enjoying an evening of food and drinks a great night out. The fully stocked bar is complemented with a top-notch beer selection, both domestic and imported. Shout out to the house Bloody Mary—deliciously topped with a cluster of green olives in a glass rimmed with sugar. There’s live music, classic bar food, an outdoor patio and plenty of room inside to toe-tap the night away. The brick facade of this bar looks old. For good reason. The building was built in 1896. Walking through the big wooden swinging front doors is like taking a step into the past. The old wood floor, wood ceiling beams and long wood bar haven’t changed much throughout the years. There’s a plentiful variety of local beer and cider on draft, plus just about every type of liquor you might ask for. Daily specials run the gamut from discounted well drinks to specials on draft beer to tequila bargains. A great place to whet your whistle, listen to live music or sit in the outdoor beer garden … with your dog at this dog-friendly place. A drive through orchards of pecans in the Mesilla Valley takes you to this small-town bar that’s been a local favorite since 1915. The windowless building houses a bar and restaurant. Be sure to try the michaladas, beer margaritas, by the glass or pitcher which are incredible especially paired with the traditional Mexican food. Or order a coahumas, a 40-ouncebottle of beer, something you just don’t find in many places—for sharing, of course. It’s family-owned and operated with friendly service and good value. Get above the fray for an evening of panoramic views, spectacular sunsets and an ex-traordinary perspective on downtown Albuquerque. This scenic rooftop lounge is refined and stylish and serves some of the finest liquor and beer in the city. Quiet conversation areas, big two-seater chairs to curl up in and large comfy couches that are just right for groups creates a relaxed atmosphere for an evening out. Specialties of the house are seasonal cocktails, many that are Prohibition-era classics. Of special note is their incredible selection of bitters that add a sparkle to their cocktails. Intriguing bar menu. Open nightly. You have to really want to come to this out-of-the-way bar, an old brick and mortar building with dollar bills on the ceiling, but it is absolutely worth the effort. White Oaks, located in rural Lincoln County is basically a ghost town with a population of 50 on a good day. However, this old West saloon, steeped in history and with great ambience, keeps bringing travelers out—by car, bike and even horse. The drinks, both beer and from the well, are cold. There’s enough alcohol variety on hand that you can call out a certain brand, too. Specialty of the house is a snake bike, a mix of lager and cider. Open Thursday through Sunday. The historic El Rancho Hotel, built in 1937, is home to this definitively old west style bar which, in its heyday in the 1930s and 1940s, satisfied the drinking likes of Hollywood western legends like John Wayne and Errol Flynn. 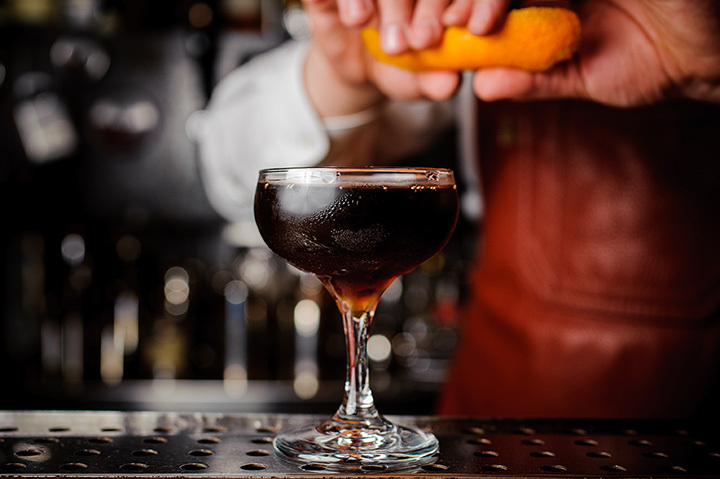 Although that era is long past, the bar is still a great place to enjoy well-made and well-priced cocktails served by friendly bartenders from a fully-stocked bar. Take a detour off Route 66 and quench your thirst here with a vodka martini, margarita or a cold New Mexican brand beer. Open nightly.